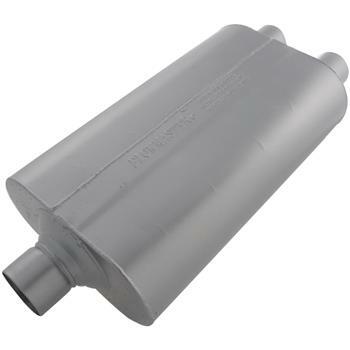 The Super 50 series muffler is a larger version of Flowmaster’s 50 series Delta Flow muffler. Originally designed for trucks and SUV’s, it is also well suited to muscle car and high performance applications. In addition, the larger case size significantly reduces interior resonance and provides a deep, rich tone along with mileage and power gains. Constructed of 16 gauge aluminized steel and fully MIG welded for maximum durability.